We pulled into the Mountains’s ski resort area around 8:30 am and saw signs everywhere with big bold font saying “WELCOME MUDDERS”. We parked close to the main entrance. We found some bathrooms to relieve ourselves after a 4 hour drive and collected ourselves. Our wave didn’t start until 9:40 am, so we had a bit of time to register and prepare. We got our death waivers and got in line to register. If there is one thing I can speak very highly about, this event is extremely and very thoroughly organized. I had heard that it was and was not disappointed at all. With over 1,000 runners at our event, we were registered within 10 minutes. After handing our death waivers in, they gave us each our number. There was one volunteer to check you in and one with a large sharpie. The sign hanging up in between the volunteers said “We don’t care if you have to work tomorrow, you’re getting your # sharpied on your face.” After having this strange man write on my arm, leg and forehead, I met up with my team and we admired each other’s new markings. We walked back to the cars to collect our stuff and do last minute gear checks and black out our eyes. We walked back into the area and walked around a little bit. Beyond the registration table was not just the starting and finishing lines, but a whole fair of things to see. Vendors from all kinds of sports and athletic brands were there giving free samples of stuff out to participants and spectators. We checked our bags in and did a quick keg toss before the race, NBD, tough mudder! We did one more bathroom run and then found my sister and two cousins who came to spectate. They laughed at us. 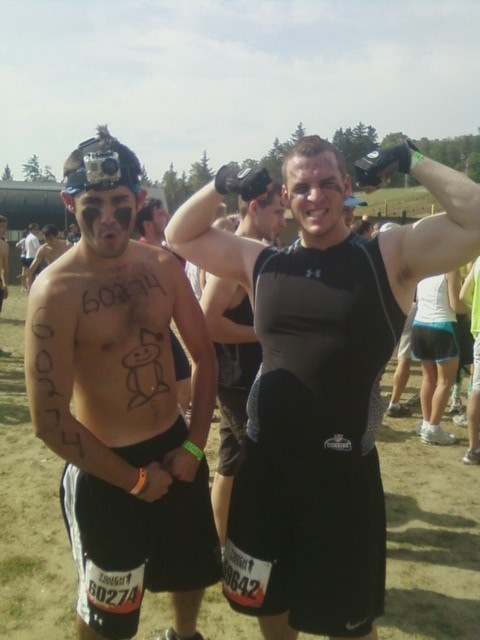 The race hadn’t started and we were covered in sharpie and black paint. Dave and I before the race. I drew the reddit symbol on his stomach. Notice he still has the camera. The head MC at the starting line had a megaphone and started screaming for the 9:40 wave to get to the starting line. We said goodbye to our little fan club and went to the starting line. 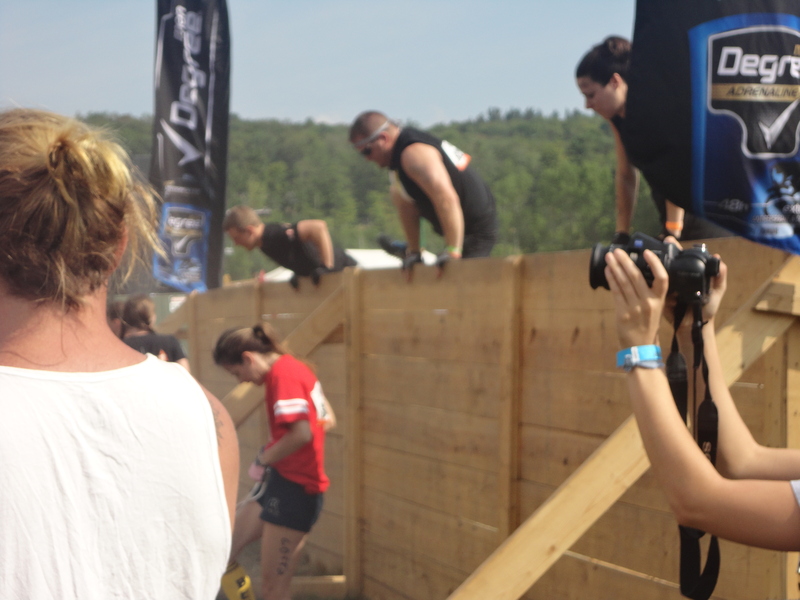 You had to climb a wall just to get to the starting line. At first we thought this was ridiculous but then considered what we were about to spend four hours doing and reconsidered that this wasn’t ridiculous at all. As 500 men and women filled this caged pit, a very fit, very spirited guy stood on a ladder under the starting gate. Eminem’s “Lose Yourself” began to blare, he got everyone in the pit chanting and cheering. His job is to get everyone pumped and psyched before they embark on this insane journey. After about five minutes of pure adrenaline rushing through the crowd, the MC got off his ladder and walked to the center of the crowd and told everyone to take a knee. The crowed lowered allowing him to gaze over everyone. The music stopped and he began to speak. He asked if any military was there running and about a dozen men stood up to receive loud cheers from everyone. The MC thanked them for their work and continued on. He talked about what we were doing there. This race is a lot of things, but primarily, it is a race to support soldiers wounded in action. This race is to test yourself, physically and mentally. He began to almost get angry about how we as a society don’t push ourselves anymore and nobody is pushing us. This day, this event was a challenge. How often do people challenge themselves like this anymore? Physically? Mentally? He talked about the philosophy of this event. It doesn’t matter if you finish first, middle or last, you finished something. If you can do this, you can do anything you set your mind to. He spoke about the camaraderie aspect. This whole challenge relates to life in the sense of you can’t do it on your own. You need others to help you, to push you, to motivate you. And in respect you do it for them. He then returned to the front as the Star Spangled Banner blared and everyone, participants and spectators, silenced themselves to reflect on what he had just said. After that it got quiet and some eerie but inspiring music came on and he had everyone raise their right hand to say the pledge. I put team work and camraderie before my course time. My sister still teases me because I got pretty excited to say the pledge. This one year of waiting and working harder was about to pay off. The three of us in the pit moments before the race started. “Eye of the Tiger” came on and the MC’s mike belted out over it. 5…4…3…2…1…The whistle blew and it had begun. After the whistle blew, we tried to just take off, but with 500 people trying to rush out of the gate, we just kind of power walked out of it. But as everyone began to space out, the running began. Up. Straight up the mountain. We could see our turning point about a 1/10 of a mile up the mountain. Not bad. Everyone still on a high from the MC’s riveting speech, people cheered and pushed hard. We got to the turn and began to come back down. Picking up a little speed we circled right back to the other side of the starting gate to come up to our first obstacle. 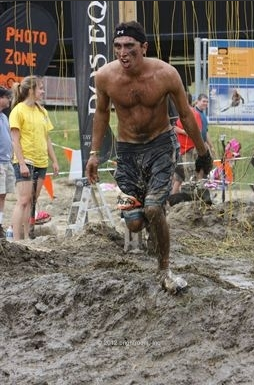 the arctic enema – This was Dave’s biggest fear when it came to the obstacles. He was pissed when he found out it was the first one. This obstacle consists of a dumpster filled with 80,000 pounds of ice, a board in the middle and barbed wire hanging above it. The objective is to jump in, swim under the board and pull yourself out on the other side. I really underestimated this one. I thought it would be a chilly in and out. NOPE. The guy in front of me jumped and splashed back a little. I felt the melted ice and thought, “not that bad”. I stood up and cannon balled in. When I stood up in the dumpster and gathered my footing, something I could not imagine happened. My whole body was paralyzed. I literally couldn’t move any extremity. A surge of fear filled me up and in an instant, all my mental strength had to push me through it. I ducked under the board and suffered pry my body out of the ice. I reached the other end and pulled myself out of the ice. When I got to the ground I quickly remembered reading in an advice blog that you should do some push ups or jumping jacks after this obstacle to loosen the muscles up. I did a few jumping jacks and when Dave and Greg got out, we started to make moves. But I literally felt all my muscles weakened within the 15 seconds I had been in that dumpster. I shook it off and pushed on. In pre-race discussions, we all had our “fears” about the race. Dave hated the ice. Greg wasn’t a fan of getting electrocuted. I did NOT want to run up the mountain. Especially with a bad toe from my PCC injury. After the first obstacle we walked up to a muddy hill with snow machines blowing at us. When we turned the corner of that path, we looked up. Straight up a black diamond ski trail. Time to run. Dave and Greg moved right along and I felt weak. Between the ice and my toe, it was as if I hadn’t trained at all for this race. Getting up the ski trail was, for me, the HARDEST part of the event. And that was expected. There wasn’t much sense of surprise when I turned that corner and looked up. After about a half hour, I had arrived at not the top, but the first water check point. I filled a small plastic cup and just threw it at my face. I started seeing signs that said “If you’re huffin and puffin now, you’re in trouble”. I felt a bit disheartened by this. At this point I just wanted to chop my toe off. The searing pressure was becoming a real nuisance on this journey. We picked up a light jog and came up to our next obstacle. 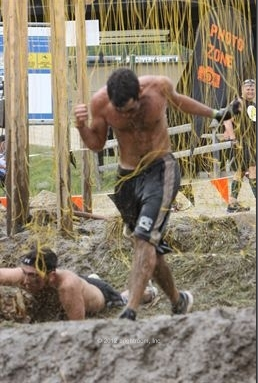 kiss of mud – This was about 40 feet of uphill mud which we had to crawl through under barbed wire. 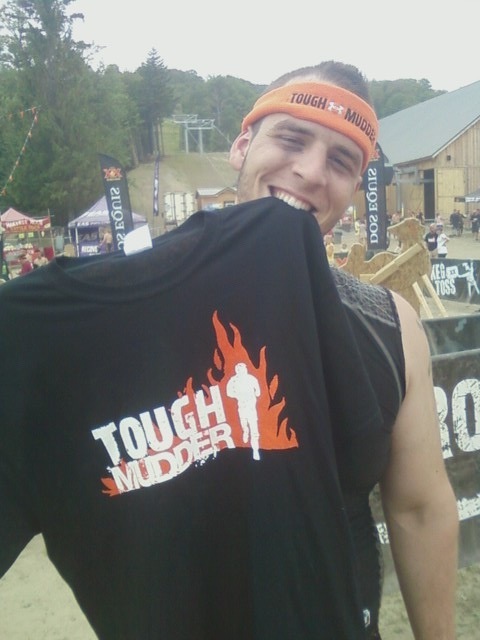 As the continuous waves of mudders loaded in, we joined. I finally felt useful. This obstacle is all triceps and finally the training came in handy. Resting on my forearms and letting my arms drag my weary body through the mud, I joined in the laughing and cheering of other mudders as we laughed at the hilarious situation that was us crawling in deep, wet, sticky, smelly mud for FUN. I got out first, pulled out Dave and Greg and a few others. Camaraderie gets much more important as the obstacles go on, I wanted to start early. After a few minutes of helping complete strangers, we let some others take our spots and moved along. When we turned the corner, there was just more straight up. The steep incline just got worse and we literally found ourselves using our hands to pull ourselves up. After a few minutes of this misery, we finally arrived to the mountain summit. It wasn’t until after the race when I looked at the map and put it together, but we just ran up a mountain. I’ve been climbing mountains for years, but we literally just ran up one, soaking wet, freezing from ice and covered in mud. When we got to the top, our little fan club had taken the ski lift up and was waiting for us with other fans. My sister tossed me a bottle of Gatorade and looked at me a bit nervous. She asked if I was ok and I admitted I wasn’t sure. This was REALLY hard. We hadn’t even gotten to mile 3 of this grueling 10 mile venture and I was already worn as hell. But despite feeling tired, I pulled out some mental strength and pushed forward. I gave her the bottle and a muddy hug, and we started running hard. As the trail began to level out and go downhill a bit, we finally started picking up speed. The rocky terrain of the summit allowed for decent footing and generous speed. We ran about a mile straight until we came up to the next obstacle. trench warfare – while some obstacles have more thorough stories than others, this isn’t one. This was a underground trench filled in pitch black. There was mud in random spots that would splash up if you slipped in. The three of us went in the same tunnel and just laughed the whole way through. At the end, the dark tunnels spit us out into a deep pool of mud. They really don’t want you dry ever during the course of the race. 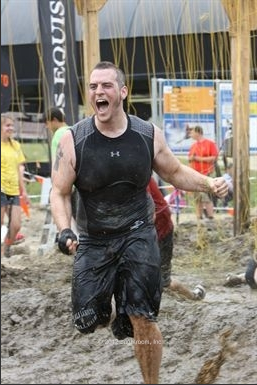 If you don’t laugh during this whole race, it is miserable. The race itself is a total punch in the face, but it’s fun. If you do it, HAVE FUN. Once you start taking it TOO seriously, the mental grit will knock you down and that’s when it becomes impossible. We came upon the next water station. It seemed like we had come SO far, only mile 3. The next obstacle was going to be our first toughie. berlin walls – These walls were about 8 feet high. The objective, get over two sets of them. I ran, jumped off Dave and Greg and pulled myself up. Next was Greg who leaped, took my hand and together we got him up. Last was Dave who jumped up and we helped him get to the top. We all just kind of jumped down. No use in being extraordinarily careful at this point. The next wall we used the same strategy. This time before Dave came up, a man and woman came over and asked if we could help her get up. Without question, we reached down. Dave and this man pushed her up, Greg and I pulled her up and she was so thankful. We all got up and went down together. devil’s beard – The next obstacle was right around the corner. This one was just annoying. While a lot of the obstacles are a huge test of strength and endurance. Some are put in place to wear you down (This includes the beginning 2 mile run up the mountain which weens out about 30% of the runners). After the walls we came to see we were going back up the mountain. After the nice brisk run down a portion of the mountain, we were going back to the top. But this time wasn’t so casual as power walking up. There was about 50 feet of heavy cargo net laid out up the mountain. The point of this obstacle is to lift it over your head. So while you are going up the steep incline, you are pulling a heavy cargo net over your head. 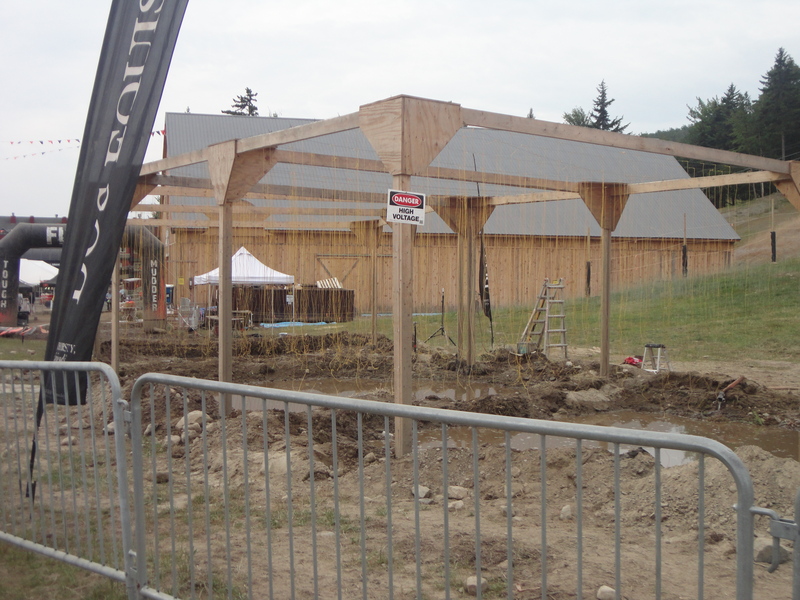 Finishing this obstacle, this thought floated through our heads, we must be close to done. We were only just getting to the 4th mile and that was only the 5th obstacle. Moving forward was the only way to go. 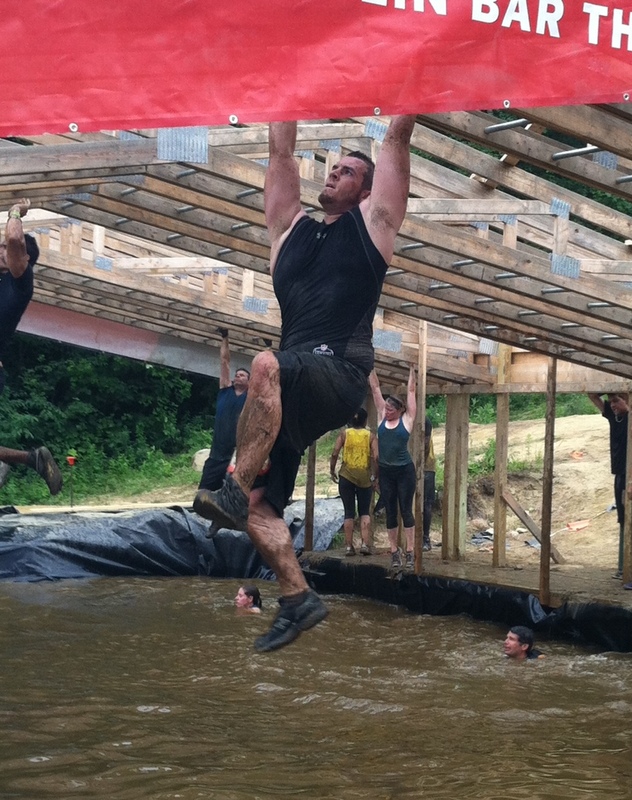 The next obstacle was one of the hardest, but definitely one of the most rewarding. hold your wood – When we got back to the top of the summit, there was massive piles of huge logs. 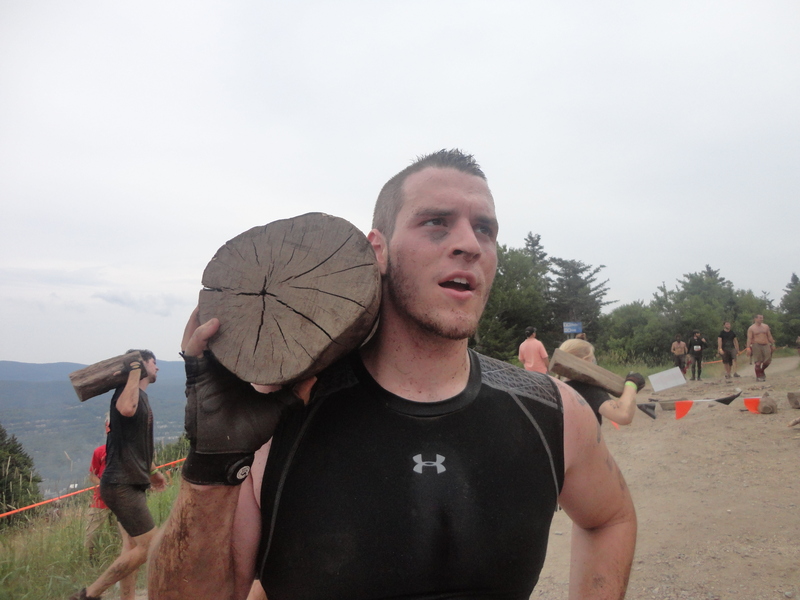 This obstacle objective, grab a hunk of tree, walk down the mountain and walk back up with it on your shoulder. 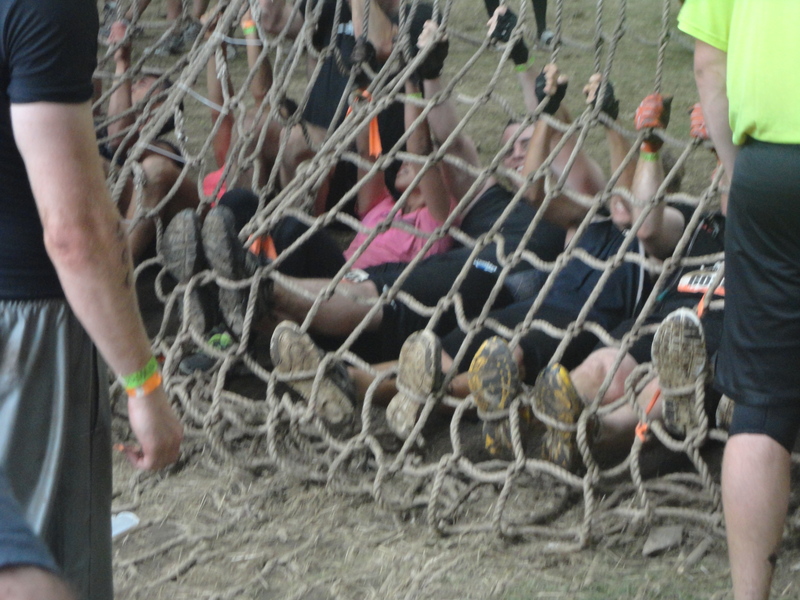 I really prayed hard during this obstacle. With that chunk of awkward tree weighing down my shoulder, I was had “Our Father” on repeat in my head giving me strength. I got to the top to see the fan group, supportive as ever, as the three of us reached the top with this annoying tree trunks. I carry logs up mountain for fun. No big deal. We threw them into the big pile and our journey continued. Since we were at the summit again there was no where to go except down. And down we went. Running through the mountain’s ski slopes we felt a bit of energy kick in. As we free fell down we quickly came up to our next obstacle. Greg’s favorite. Electricity. electric eel– When I told anyone about this race and explained that inevitable I would be electrocuted during it, they thought I was crazy. I thought I was crazy. 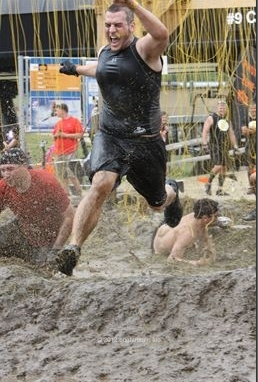 I wasn’t a huge fan of having 10,000 volts run through my body. But I wasn’t going to avoid it, and I certainly was not here to skip obstacles, neither were my teammates. So as we approached this one, we cursed that the time had come and took our places. What I hated about this one was that I got stuck behind a slower woman. While I respect everyone goes at their own pace, with electricity forcing its way through my body, I wasn’t up for going slow. This obstacle is probably a 30 foot long, 1 foot deep pool. You would get in and lay flat so you were completely in the water. But there were electrical wires that dangled about an inch or two above the surface of that water. So when you came up to breath or used any method of pushing your body forward, you were getting hit with wires. The first time I got hit with a shock, it went right into my lower back. People who had done the race before commented that getting shocked felt like getting punched with a sharp point at the center. This is exactly right. What they didn’t mention was that post shock, you were numb in that area. After a few minutes of struggling, I finally passed this woman and found my way to the end. I got out and pulled her out after me. If you zoom in, you can see the wires above the water. dong dangler – (funny names right?) A brisk run continuing down the mountain and we arrived at the next obstacle where there was massive back up. Usually getting to an obstacle, there was the few moments of wait time merely to collect yourself, but this was different. 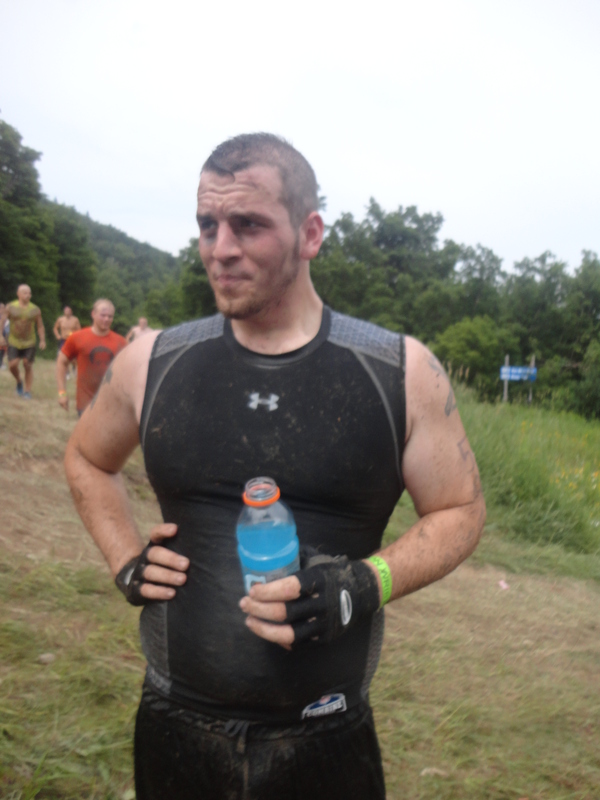 There were tons of mudders waiting to get through this one. This obstacle was over a small lake. There were probably a dozen plastic heavy duty ropes that were strung from one end to the other. The objective was to grab on, thrown your legs over it, and pull yourself across. Seems easy right? Sorry, nope. What was causing the back up was because of safety, they couldn’t let everyone go at their own pace because when people fell into the water they had to get cleared to the other side before another could continue forward. When we got up to the platform, Dave went first, I followed and then Greg. I couldn’t see them because I was focusing on keeping myself locked onto the rope, but I heard a splash and looked down. Dave was in the water. I pulled a bit further and as I felt myself beginning to slow down I let go. While this was the only obstacle the three of us “didn’t finish” it was worth it. Falling into the lake was so refreshing and definitely worth not wasting strength trying to hold on. Greg fell in about where I did and we met up on the other side. cliff hanger – This was miserable. This was just a straight up cliff. We got on our hands and knees and crawled to the top. This was just no fun at all. Blah. Another water station and some breath catching. We were feeling pretty good at this point. We were just under half way there and our team was filled with some positive vibes. tired yet? – After our water break we headed up to the next trial. 50 yards of tires. High knees all the way. What made this obstacle not awful was the snow machines blowing on us. The cool ice slowly raining down on us felt quite refreshing. spider web – As we came up from the tires, we turned the corner to see our fan club and a 30-40 foot high cargo net. 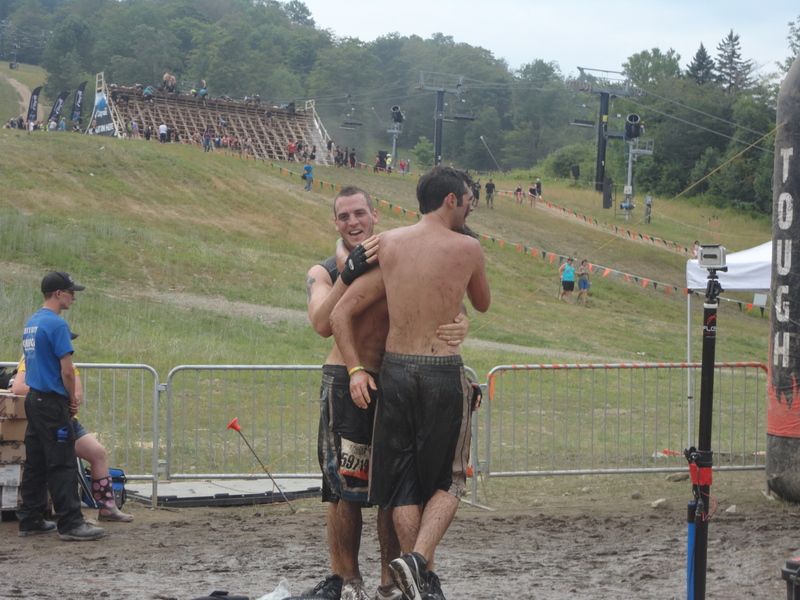 We walked over to them and shared some muddy hugs, had a drink and got in line for the climb. This was one of the obstacles where camaraderie played a huge role. As we stepped up to the cargo nets, we were careful not to step on the fingers of people on the other side holding it down for upcoming climbers. What one might not realize upon looking at this obstacle is that the net is free. It just hangs from the top with no leverage at the bottom. So if you were to just start climbing it would swing back and forth. After climbing it, it was customary to take the place of someone else to weight it down so that climbers could have an easier go. My sister commented about how much she loved seeing complete strangers help one another. It was a nice site and something you kind of wished would happen more in life. We then proceeded to run. This was the first time in a little while that we just straight ran. Through the woods it was actually pretty beautiful. The nice trails were a relief for our muscles after so much climbing and such. As we came out of the woods, more uphill. EW. 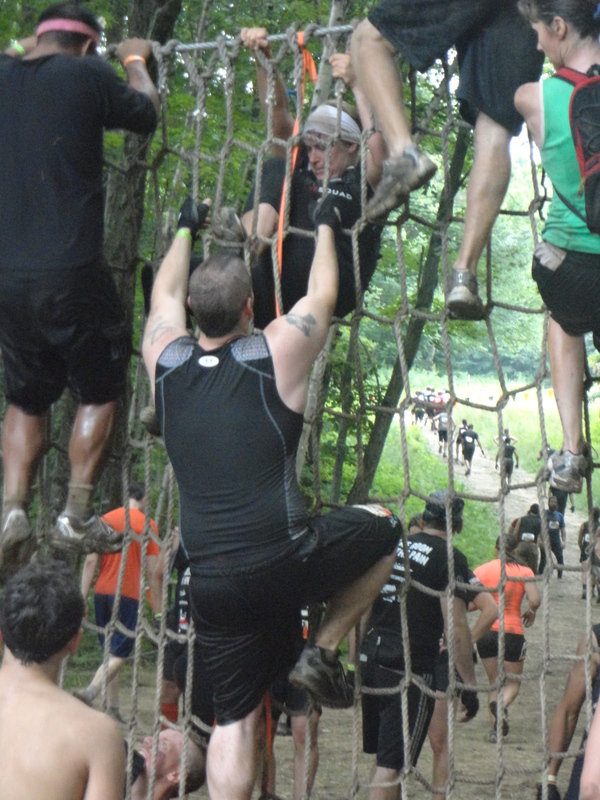 You could hear the groans of fellow mudders as we saw more straight up climbing. I remembered reading some guy’s blog on the event that said the hardest part of the whole thing was going up and down the mountain. I second this statement. The climb to the top led us to the next obstacle. the ringer – This was an interesting obstacle, not particularly hard. The objective was to approach this custom built set up which involved two sets of two large heavy barrels hanging in the air. With some help, one would have to be pushed between the two barrels and then through the next two and then spit out into a big pool of mud. During this whole scene, considerably cold water poured out on top of everything and everyone to ensure you were soaked. It is hard to explain because it was considerably hard to fathom when we looked at it. We started running afterward. We were approaching the next one when an older gentleman in a truck started lobbing bottles of water to each of the runners. He was just a funny guy having fun watching insane individuals run this thing. We shared a bottle, took some gulps of water and dumped the rest on our faces. Which was completely unnecessary as we approached the next trial. 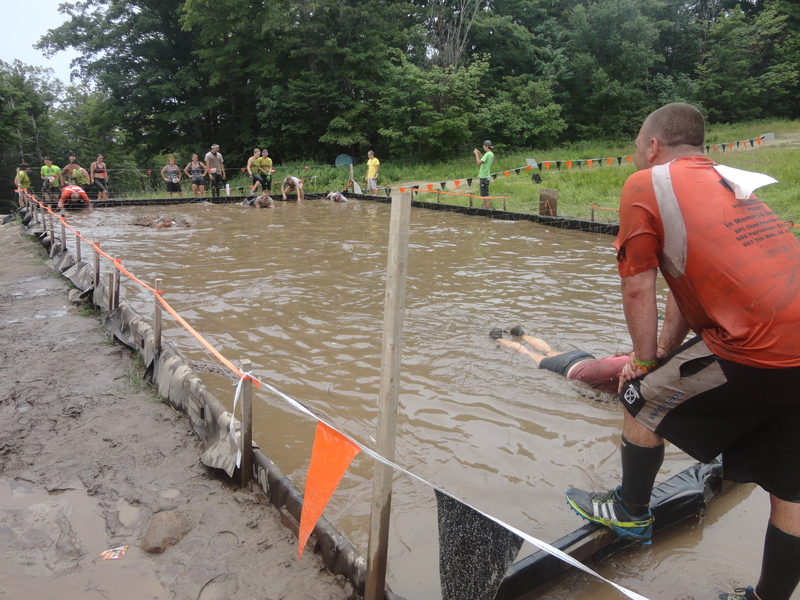 walk the plank – This was my favorite obstacle. Though Dave might argue it was the worst. As we approached the obstacle and watched, we kind of starred for a moment. This was a 20ft high wall with ropes hanging down. We had to climb to the top and leap off into a lake. Once in the lake we had to swim around the wall back to shore. People were allowed to skip this one because of the considerable swimming skill needed. While I find it easy to swim, after running near 6 miles and climbing, crawling and swimming through other stuff, you are pretty tired and your body is pretty worn. But there was no way we weren’t going to fly off this thing. We climbed to the top and waited for the lifeguards to give us the go. When we got to the top and looked at how high we were, it was a bit nerve racking. But I turned to Dave and said put the camera on because I wanted to back flip off. He laughed and said no way would I do it. I made sure the camera was rolling and pushed off and did an awesome flip off the wall into the water. I came to the surface and the cold water felt so refreshing. Greg and Dave were laughing at me and I pushed back and told them to jump. As I was watching them prepare to go, I looked over and noticed other guys with their Go Pro cameras in their hand. It quickly dawned on me that flying off this wall into the lake is probably enough pressure to push an elastic headband with a camera off your head. But before I could say anything I looked up and Dave was mid jump with the camera resting on top of his head. The lifeguards told us to keep swimming so I missed him hit the water. But when I climbed onto shore and spun around, his head was bare. He hadn’t had the camera for 24 hours and the force of hitting the lake pushed it off. When he got to shore he called over a volunteer and explained it and all they said was you can’t dive in now. Come back later. After the race, he went to the information desk and they gave him a map to the lake. He went up and dove and never found it. Somewhere on Mt. Snow there is a Go Pro camera with my sweet back flip footage and it is lost forever. Though Dave was much more angry than I was. All I lost was some footage. He lost a $350 camera after owning it for 20 hours! The loss was frustrating and Dave ran ahead to blow of some steam and Greg and I slowed down to catch our breath. The next few obstacles weren’t too memorable. In about knee high mud we had to climb over and under knocked down trees. It was tough but not very eventful. Then we came to the next fun one. Another favorite of Greg’s. MORE ELECTRICITY. 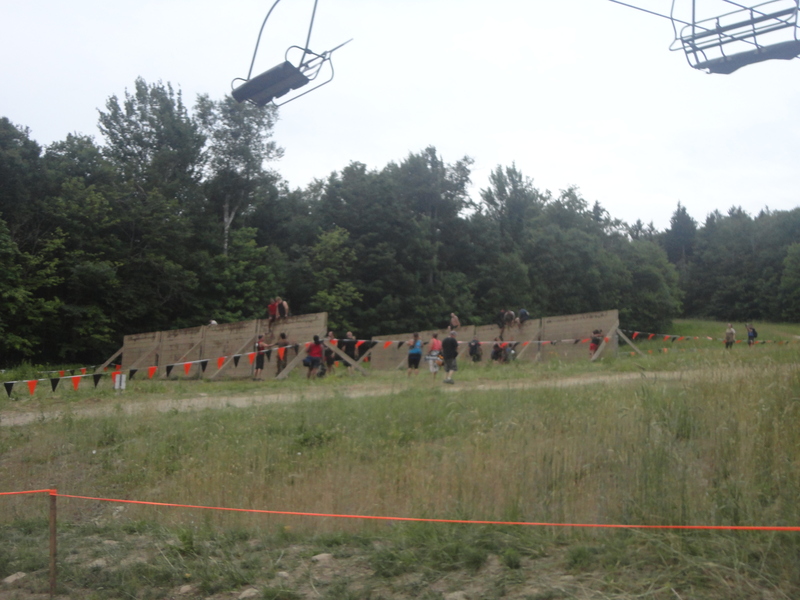 dark lightning– This obstacle was actually kind of freighting. We walked up to see a bunker looking set up. It had barbed wire about 3 feet off the ground with signs that said start crawling. There were hanging curtains that we needed to crawl through before we could see what exactly we were crawling into. But once inside, we still couldn’t see. I have no concept of how long this distance was. We were in a pitch black room with water showering down on us and the loud sounds of lightning crackling all around. After 10 seconds in the dark a strobe light went off and we saw them, more dangling electric wires. What was somewhat terrifying about this was if you didn’t pay attention you might get one in the face. The crawl was a strategic one. We waited for the lightning to go off and when the light would shine in for a brief moment we would crawl as fast as we could avoiding wires. About 3/4 of the way through my ankle got shocked. This is where the numbness hurt me. I couldn’t use that ankle and had to employ my other extremities to work harder to get out of this thing. Spectators could peek in, so my sister snapped this photo of Dave and I planning our strategy as quick as possible. 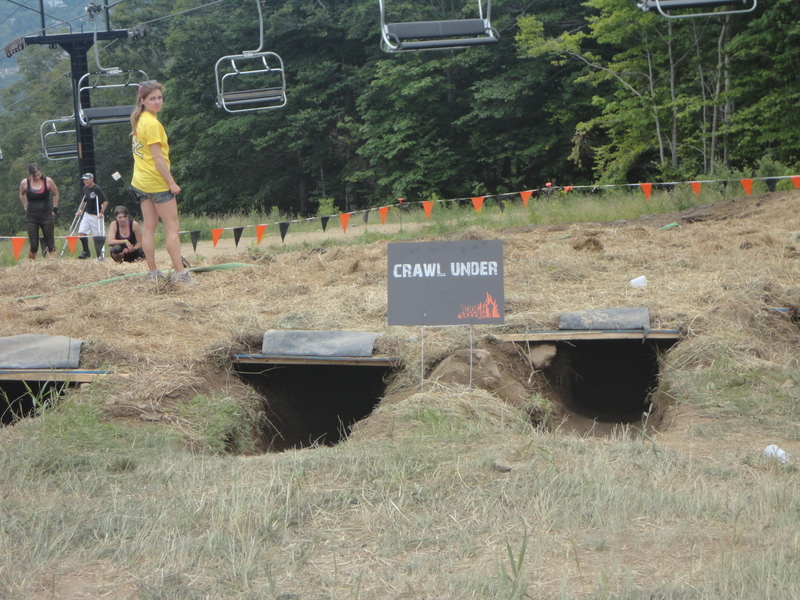 We crawled out, this obstacle took a huge toll on us. We were cut up and bloody and bruised. We did however see a sign saying mile 8. This was a big moment of hope that the end was near! We started running and saw ANOTHER FREAKING PATH UP THE MOUNTAIN. My sister who had a map shouted this was our last time going up it. Thank God. We pushed through and stopped at the top to catch our breath, trying to gather which of the obstacles we had left to do. We crossed through a path in the woods and saw our next challenge. funky monkey – I enjoy pull ups. I was so excited for this rendition of the childhood activity of monkey bars. These were monkey bars that went up and down and hovered over a large pool of ice cold water. What few people know is that these bars are continuously greased with vegetable oil. So despite having gloves, getting a grip on this one was much easier said than done. However all that being said, all 3 of us got across. We were so proud of each other for not falling into the water. Especially as people climbed out of the pool saying it was freezing. We had a little bro hug and pushed on proud of the team. We approached a water station and took a little bit of a longer breather. We only a 6 obstacles left and wanted to gain some energy. Drinking some water and talking about the monkey bars, we had high spirits and decided to push on. berlin walls 2 – There are two sets of walls during the race. The first ones we did early on were 8 feet high. These were 12 feet. It didn’t seem like a big difference at first but as we walked up, we grimaced at the much bigger difference in height. Our strategy was the same as the first time. Though Dave needed a boost to get up to us. We moved through the two sets of walls and walked out. This one was very tough and took a lot out of us. fire walker – A quick run through the woods brought us out to the fire run. This was running on very muddy ground, between two large sets of hale bales on fire with smoke everywhere. The trick to this was holding your breath. If you breathed at all, you were getting lungs full of smoke and going down into mud. This was pretty easy overall. The run through was not nearly as long as we thought it would be. Running through was just very hot. But keeping focused we got out quick. twinkle toes + boa constrictor – Twinkle toes was a balancing beam over cold water which we all made it over without falling. Pretty easy. Boar constrictor was two large sets of tubing, one set going down into water, the other set coming up out of it, both set at about a 45 degree angle. I found this one tough because I have pretty broad shoulders and they rubbed against the sides of the tubing. I had to kick and push with my feet because my arms were pretty useless for this one. But after some consistent fidgeting I made it through. Dave and Greg laughed at me as I pushed out of the last tube. And as we got up seeing only two obstacles left, we grimaced at them. everest – This is a 15 foot high half pipe slicked with vegetable oil with pool of water and mud before it. Objective is to get to the top by any means necessary. Again, a very proud moment for team rage face, we all made it up in one run. This is a famous obstacle for TM and is known for the camaraderie aspect. 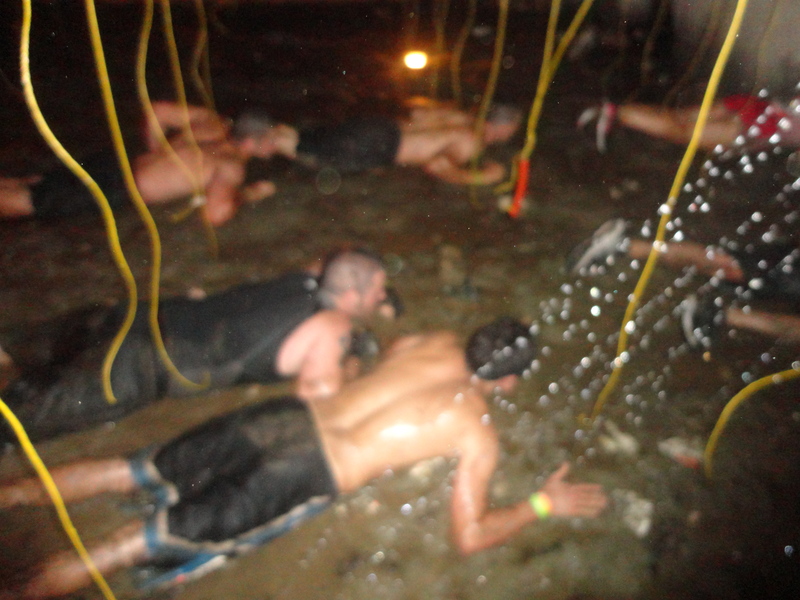 Along the top of the ramp are about 2 dozen mudders laying on their stomachs with their arms hanging down. As you run and jump and launch up the ramp, they grab and pull. A few guys helped me up first and then I helped the other two. We decided to stay up there and were helping for about 10 minutes. After watching some attempts to get up I was so thankful we made it up in one go because some guys would launch in a full sprint, leap over the mud pool and slip on the oily ramp to fall face first into a plexy glass ramp. All you could hear was the LOUD thud of their skulls against the ground. There was a woman who kept falling and me and a guy laying beside me told her to run to us. She did and we got her up and gave us both a peck on the cheek. Cute moment. The three of us began our venture down from top and soon found ourselves facing the last obstacle. The last and most dreaded obstacle. A straight shot through 40 yards of dangling wires charged with 10,000 volts. Once we got through here, it was all done. Underneath the wires were pools of water and mud with small walls forcing you to jump into wires of all lengths. We waited til it was clear and the three of us shared a moment. We knew this was it. We screamed a little OOH RAH and we were off. At this point I was only in my head. I had read that people get shocked on this one and just drop because of the pain. As I entered the electric field I realized something that I didn’t know before going into this. The wires collected on your body. So as you ran, they would drag up until they fell off. Through the first pool, over the mound. I started feeling the zaps. The adrenaline was so high at this point I wasn’t stopping. Months of training and anticipation lead to this moment. Through the second pool and over the middle mound. I felt the wires collecting more and more on my chest and felt the hard shocks hitting me all over. Through the last pool and a leap over the last mound to get out. I felt a shock hit me in the face as I came back to connect to the ground. And it was done. I through my hands in the air. I did it. The little smudge on my face is a wire hitting my cheek. As the adrenaline cooled down I spun around to see Dave crawling out and Greg beside them. After watching the video later on, I saw that they had fallen in at the second pool and crawled out. I hugged Dave and we waited for Greg and had a team hug. We had started and finished together. All the pains of the race led to this great success. 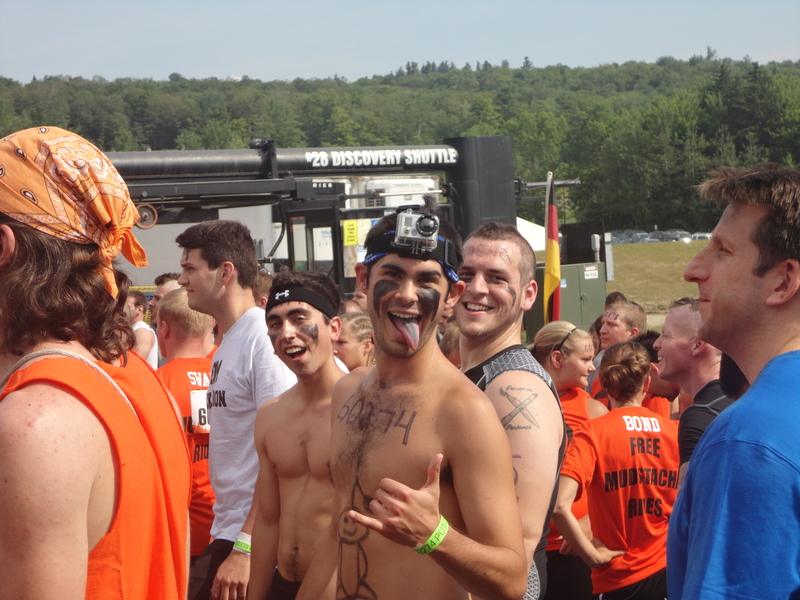 lineWe walked through and some volunteers placed the Tough Mudder Orange Headband on each of us. We moved forward and got our runners shirts. Each of us grabbed a cup of water and scarfed down a banana. We then followed finisher tradition and picked up a beer each. We walked through to find our fan club all excited and we hugged and stood speechless after this whole ordeal. What a freaking day. 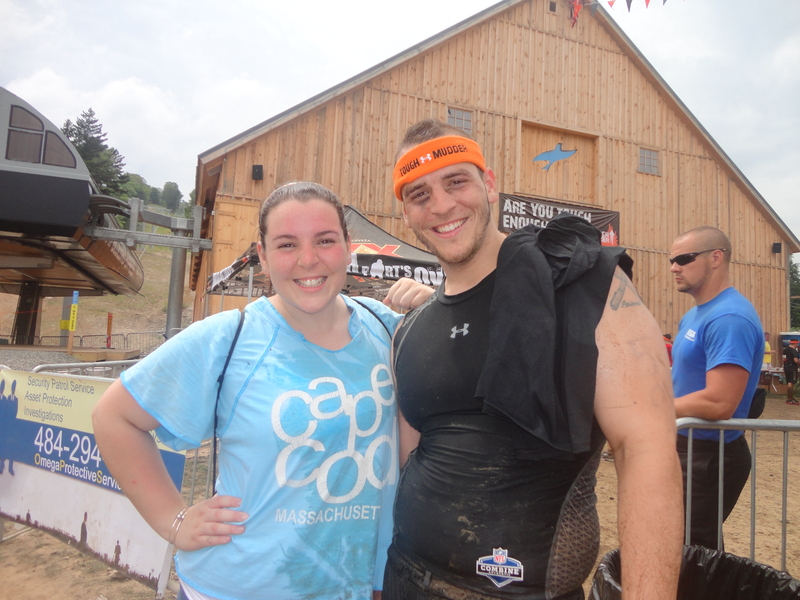 We took pictures and showered under some cold hoses to get mud out. Though I didn’t get all the mud off for about 3 days. Dave went up the mountain to search for the camera so we said our goodbyes. I walked over to my cousin’s car and we loaded in. Slowly as the adrenaline began to fade, ALL THE PAIN SET IN. I was a hurting pup. Everything hurt. Literally parts of me I didn’t know existed hurt. I would soon learn that I was electrocuted between the legs so I was hurting there as well. I passed out in the car and they drove me to work. Yeah, I freaking went to work after all this insanity. I got there late and got smiles and thumbs up from friends. People asked about it and all I could really process at the time was, “it hurt, a lot”. I laid in bed that night with the sweet smile of satisfaction. Sure I was in pain, sure I was going to be struggling the next morning. But I did it. I accomplished something. Something that took both physical and mental strength. Something that took determination and will power. Something that I would never forget and something I would strive to accomplish again. If you have read the entire story to this point. THANK YOU. It means a lot that you have followed my journey. When I taught the workshop on the race and it’s philosophy to students over the summer, their reactions were interesting and hilarious. A group of boys asked if I would do it with them when they were of age. A few said that the idea behind it was quite inspiring. One girl told her proctor she pretty much learned 23 ways to kill herself by listening to Mr. Frazier. I apologize to my friends and family who have heard about it way more than they may have liked. But as you can see it was very important to me. Thank you to them for listening to my stories, giving me support and believing in me when I didn’t.